The ADB Sensor Tester (ADBT) has been designed to test 4B adjustable depth bearing (ADB) style temperature sensors in the field. During planned maintenance or periodic testing, the ADBT can be used as a diagnostic tool to verify the alarm and shutdown sequences of the control unit are functioning as expected. The unit operates in two testing modes, direct (heated) and indirect (simulated). In direct mode, an integrated heating block within the ADBT heats the ADB sensor probe to the desired trip point, and allows quick and easy real life testing of the sensor and temperature monitoring system. 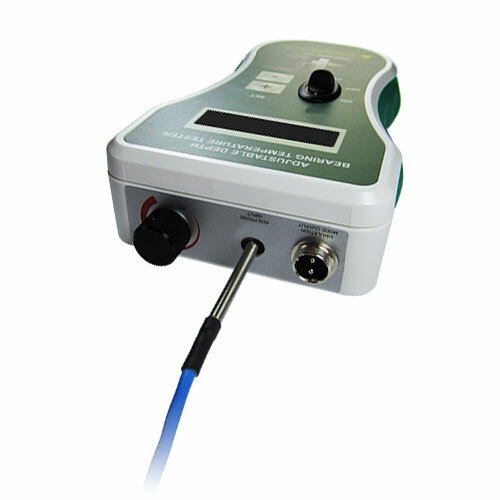 Using indirect mode allows simulated testing of NTC type sensors within the network of 4B’s T500 Hotbus control unit. By connecting the ADBT to a TN4 node, testing of the node and the network is accomplished by simulating the temperature above the sensor’s trip point and monitoring the response of the control unit. The sensor screw directly into a bearing housing through the existing grease zerk thread. Each sensor is fitted with a grease zerk to allow lubrication of the bearing without the need for removal of the sensor. Probes are adjustable and come in lengths of 2, 4 or 8 inches to accommodate different bearing sizes. Can I use the ADB tester with other bearing sensors? 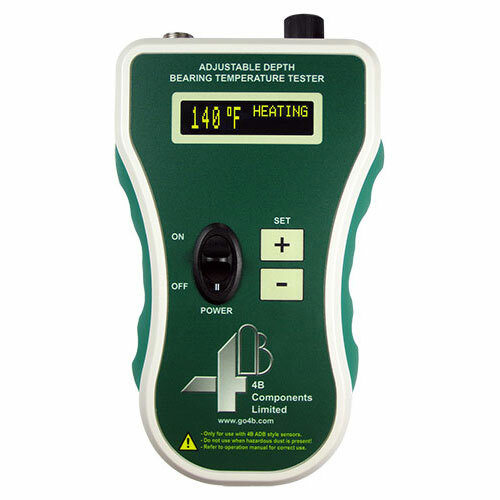 No, the ADB bearing sensor tester has been designed for 4B ADB sensors only. Why is the LED display not functioning? You may need to recharge the battery. The testing temperature set buttons are not working? Turn the ADBT off and try again, if the buttons are still not functioning recharge the battery. Why is the heater block is not warming? My ADB sensor is not responding as expected to testing, what could be the issue? 1. Make sure the ADB sensor probe is securely inserted all the way into the tester's heater block. 2. Check the alarm and shutdown settings on the control unit. The LED display shows "ERR OC' or "ERR SC".